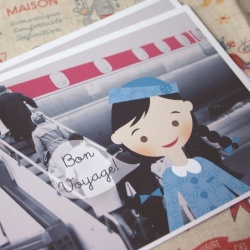 Home :: GREETING CARDS :: Shutterbug Series :: Bon Voyage! Our new shutterbug series is a creative combination of photography + digital illustration. This photo is an old snapshot taken of my in-laws as they were about to embark on some fantastic journey. Ms. Stewardess was created digitally and added to the retro airport photo. White borders give this an old school shutterbug feel! Info: Choose from 1 noteflat + 1 envelope or a set of 10 note flats + 10 custom size envelopes (and save!). Each card measures 4 X 6". Professionally printed on heavy, matte cardstock. Packaged in a crystal clear box. Got stickers? Add 10 matching stickers for an additional $2.50! Backsides are blank and ready for your super sweet thoughts! This product was added to our catalog on Thursday 21 June, 2007. Blue Floral Pop Happy Birthday!